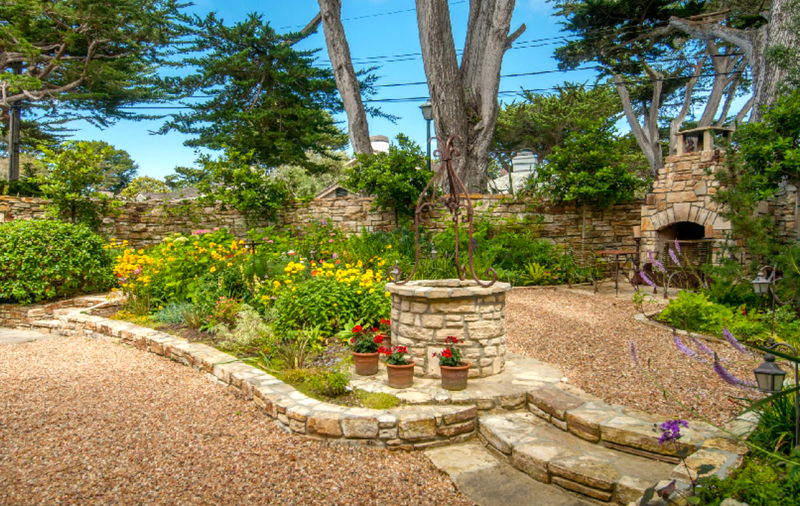 I love photographing Carmel’s cottages and accumulate quite a collection . 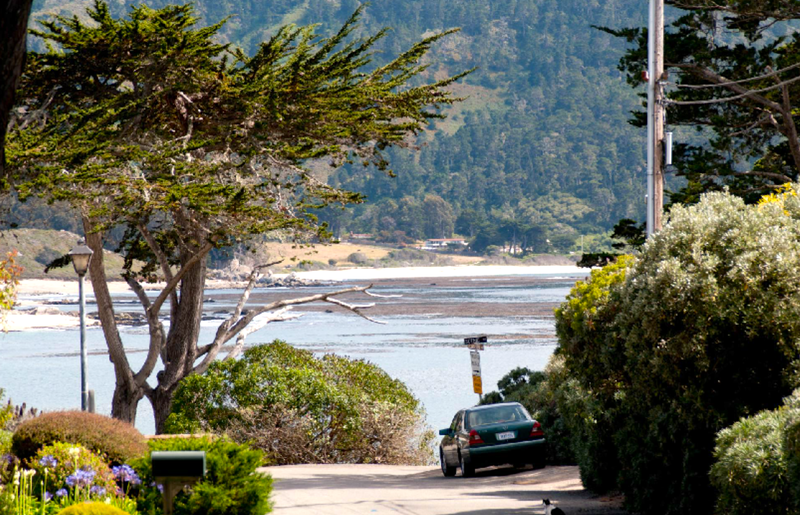 I take photos of a beautiful Manor House on Carmel Point and name it “Stately Manor” for lack of a name on the gate. I would love to know what lies behind the stone walls. This week I find out. 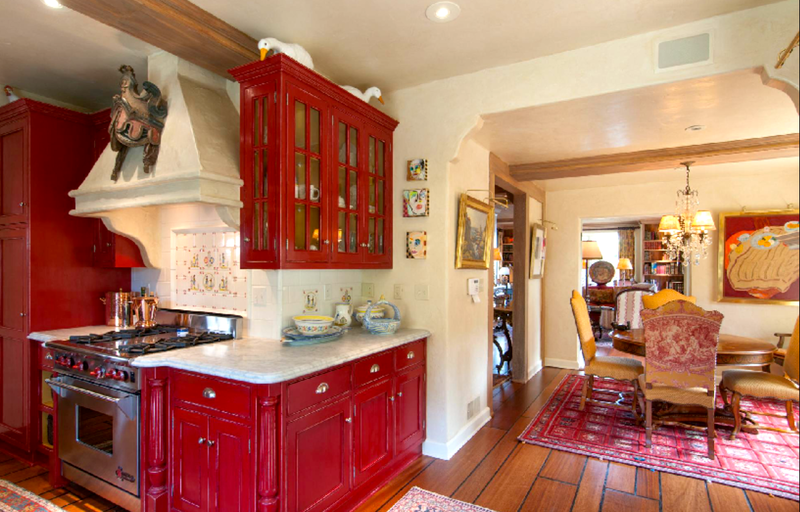 The home is featured in The Pine Cone and is for sale. Oh my, it is one of Hugh Comstock’s creations. 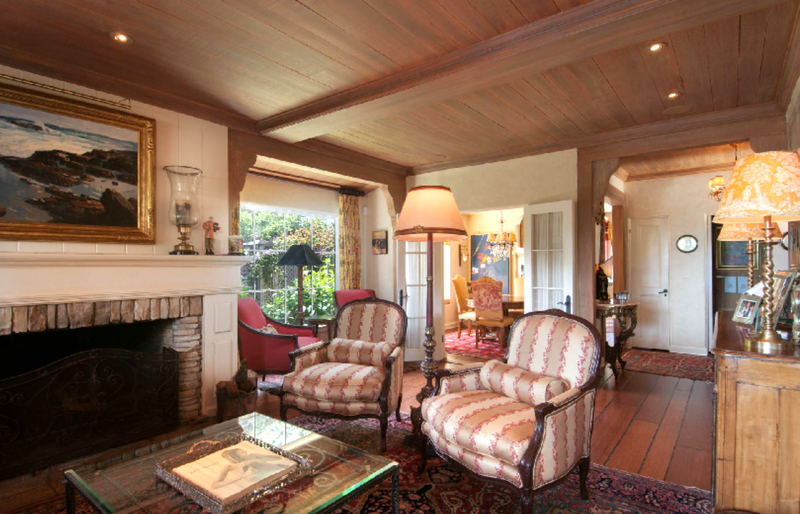 Hugh evolved with the times and built ranches and larger homes as well as his small fairytale cottages. 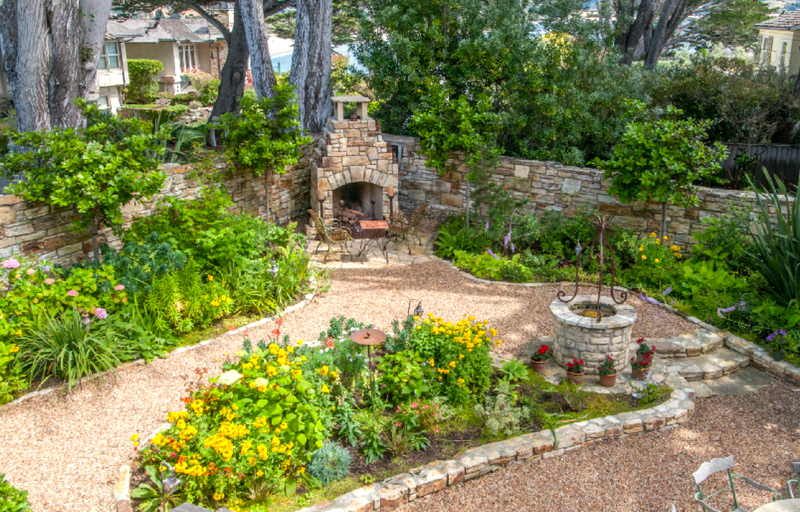 Carmel Point is outside the one-square mile that is Carmel-by-the Sea and the building code is less strict enabling builders to build larger homes and gardens. 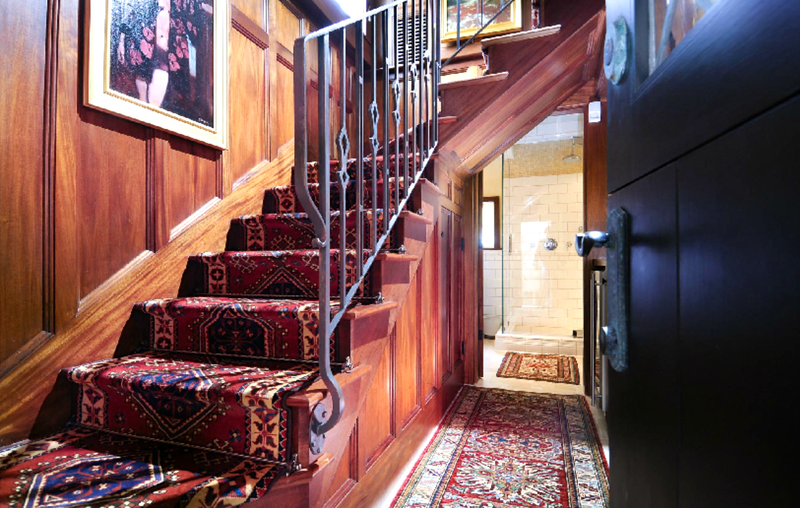 Hugh builds this 2,535 sq.ft. 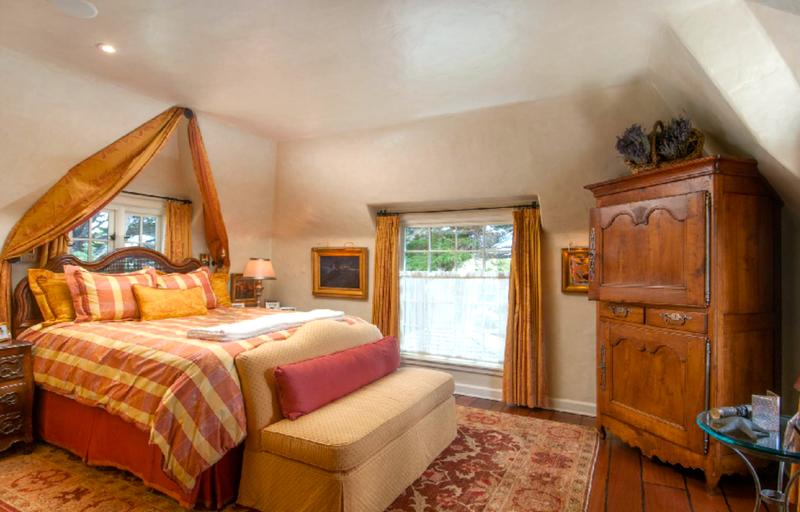 cottage in 1932 on a large lot just moments away from Carmel River Beach and Estuary. 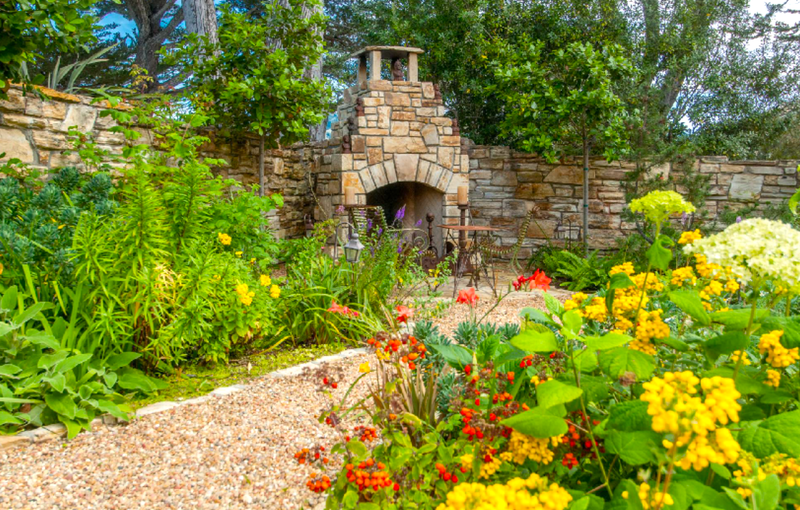 Alain Pinel lists the home for $5,900,000 and provides wonderful photos of the home and the gardens that surround it. 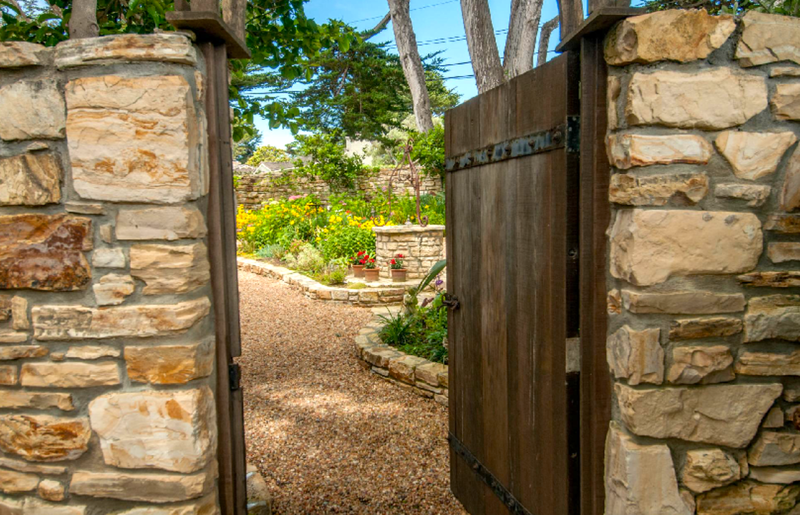 So lets step through the gate and tour the garden . 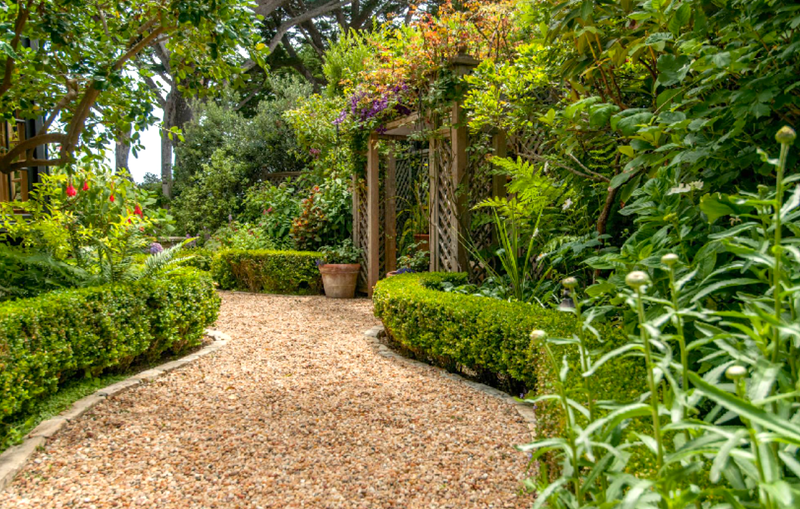 Wide gravel paths lined with boxwood give a nice structure and help direct us around the garden enclosed within tall stone walls. There is a well in the front garden. 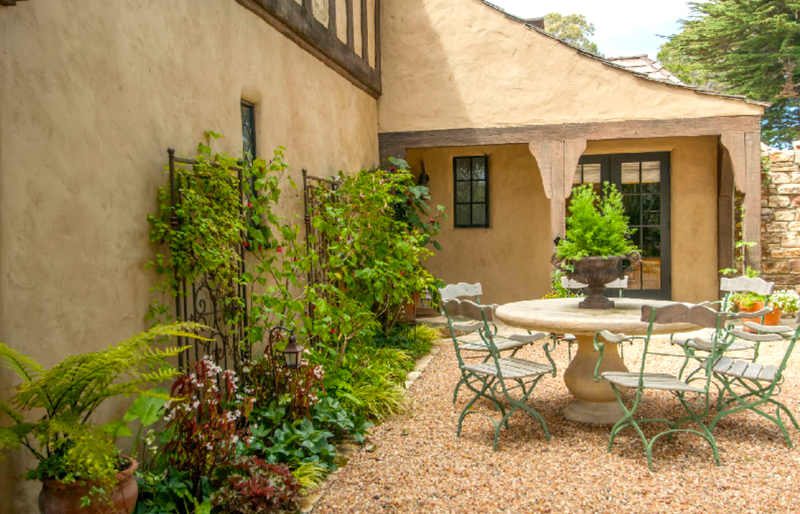 A large stone table and chairs sit outside for al fresco dining. Vertical plantings “decorate” the wall. The stone of the fireplace blends with the wall. A second table and chairs offer a delightful spot to warm oneself on a cool Carmel evening. 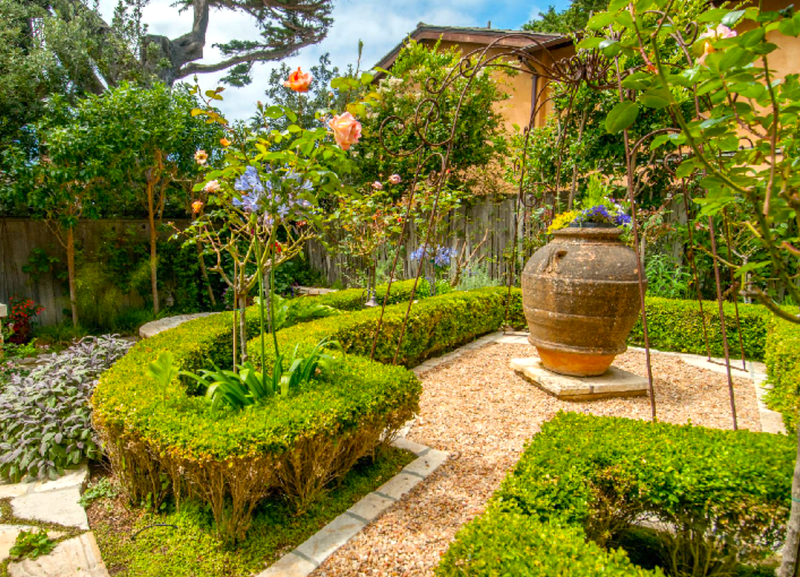 and a large urn sit amidst colorful plantings. 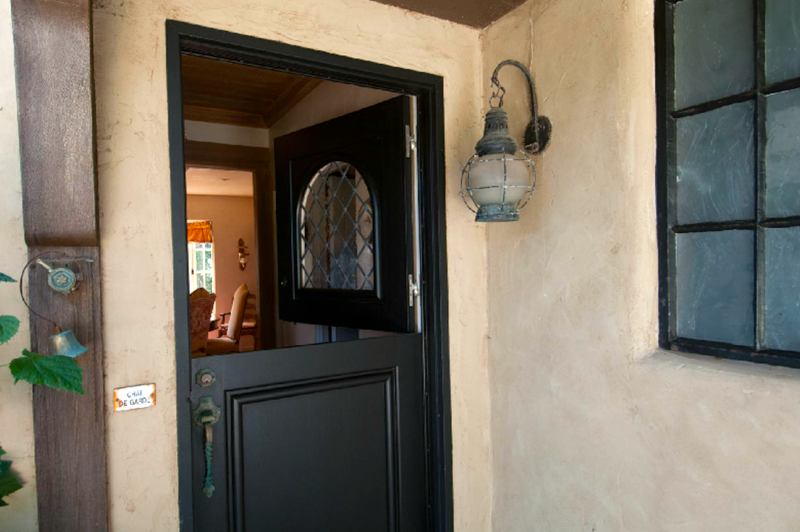 The Dutch door opens to a home rich with color and detail. The sign “Chat de Guard” confirms my suspicion that Francophiles live here. 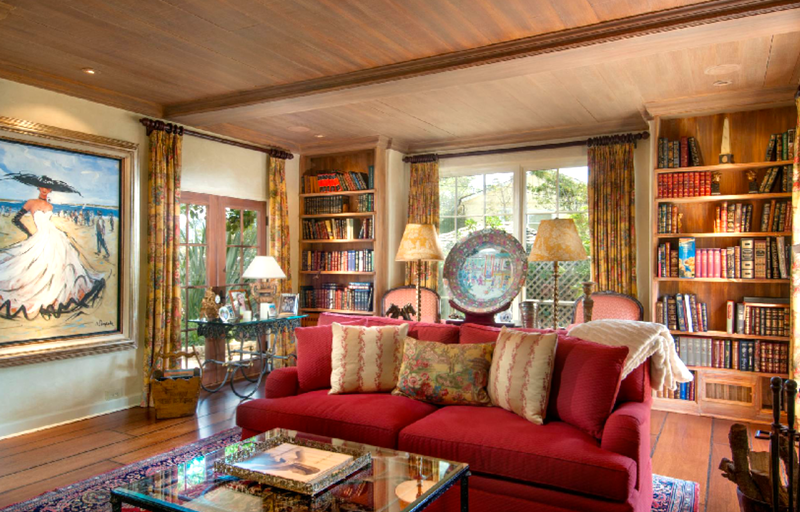 I love the warm colors and patterns of drapery, rugs, pillows and plates, lamp shades and books. The furniture clusters around huge fireplace. 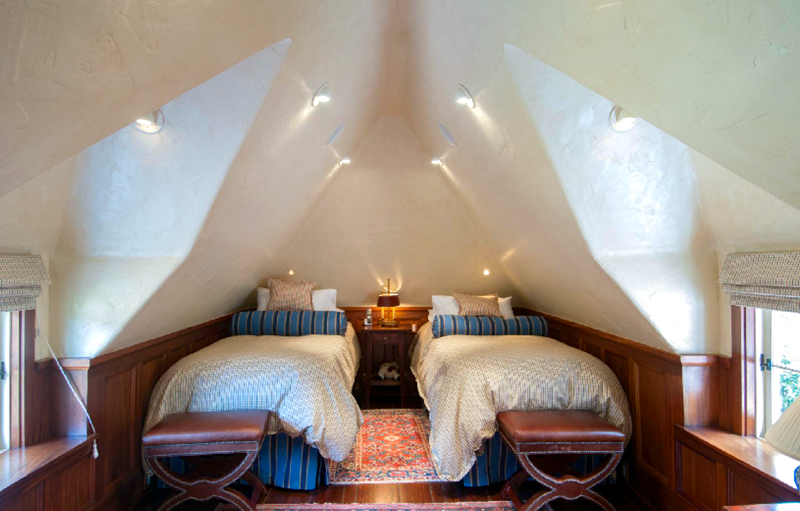 The wood floors and ceiling cast a mellow glow. The dining area sits between the living room and kitchen. I LOVE color and this is a feast for the eyes. 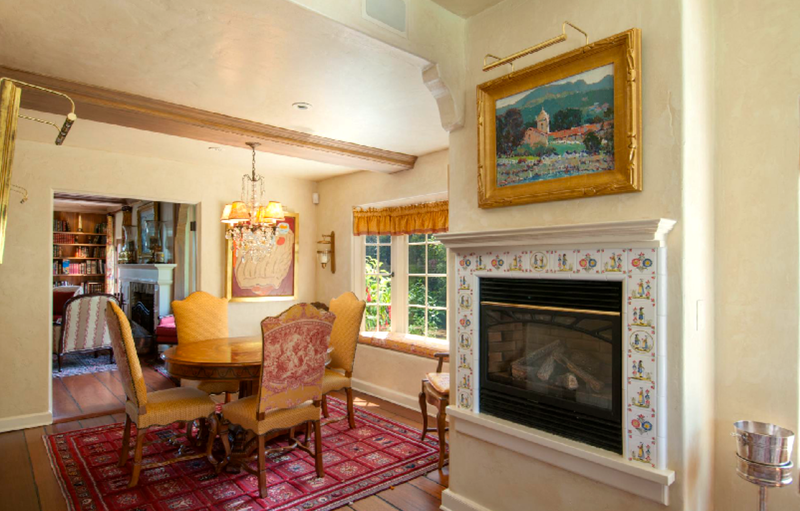 Country French tiles surround the raised fireplace. 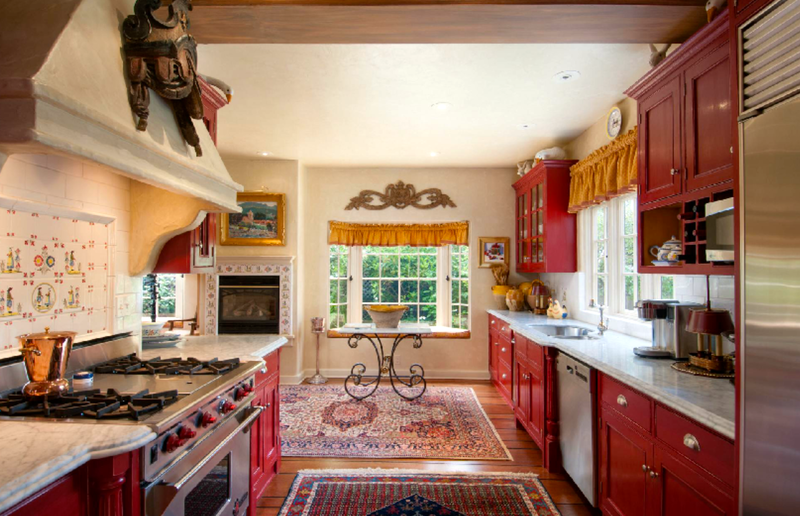 Even on a foggy day, red cabinets and yellow curtains will make the room cheerful. Light from the bay window with its window seat floods the room. I try to take in all the art, copper, pottery and patterns. The cottage is furnished by someone talented enough to make bold choices. The feeling is definitely Country French. 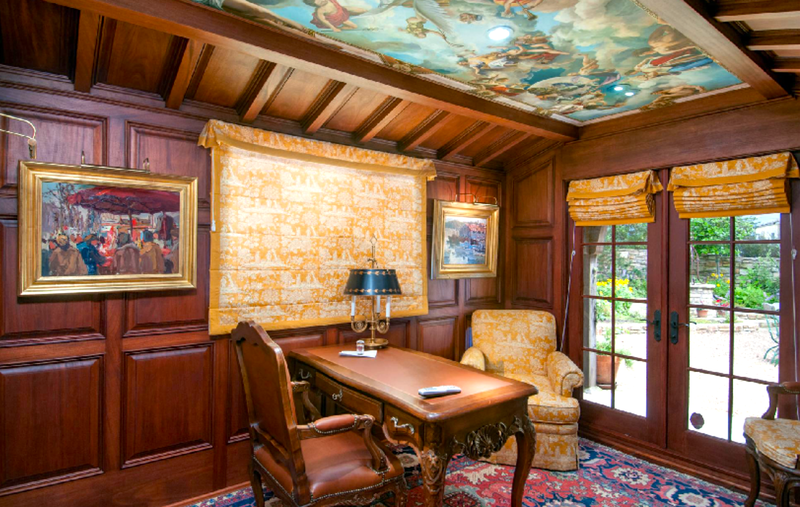 The wood-paneled study looks out to the garden. 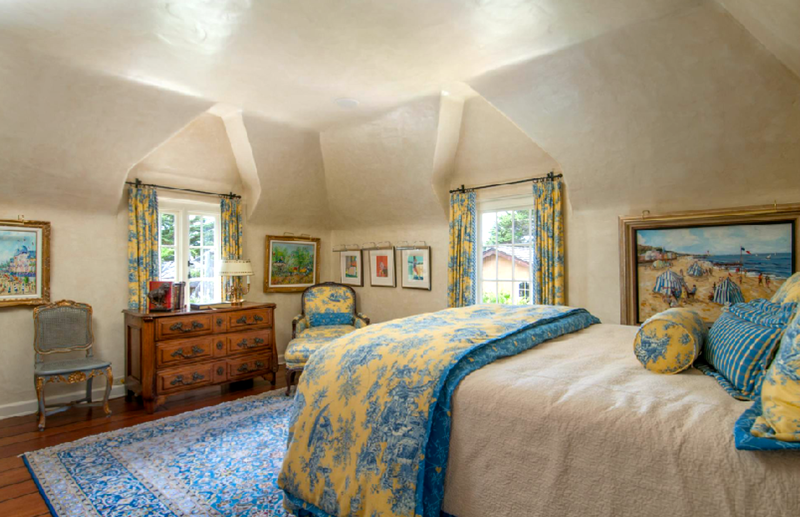 lead to amazing bedrooms and baths. 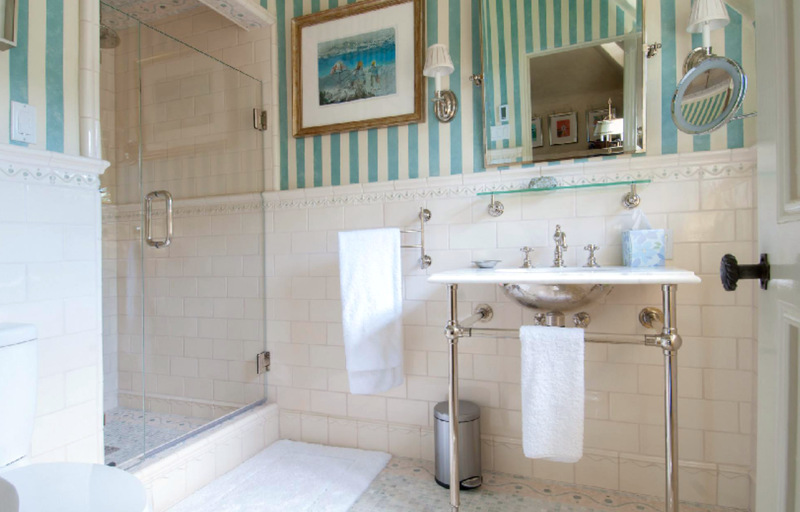 And in the bath wallpaper. 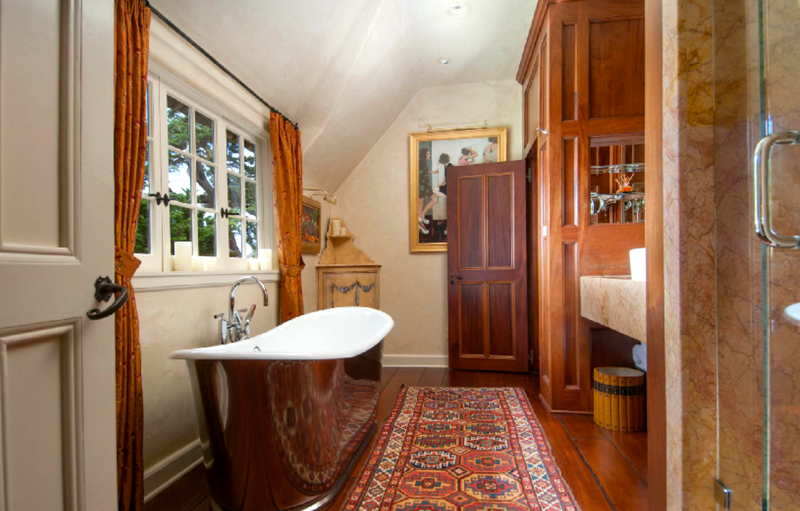 And the tile floor is exquisite. Thank you so much for sharing your Carmel passion with the rest of us! Wow. Love it and I’m not a red and gold person! I think I could make an exception 😉 That bathtub! They’ve done a wonderful job of updating (and probably upgrading) it and keeping the original charm and European feel. Thanks for the tour. Well this is a great home. I do not believe that Comstock built it as I watched it being build years ago. 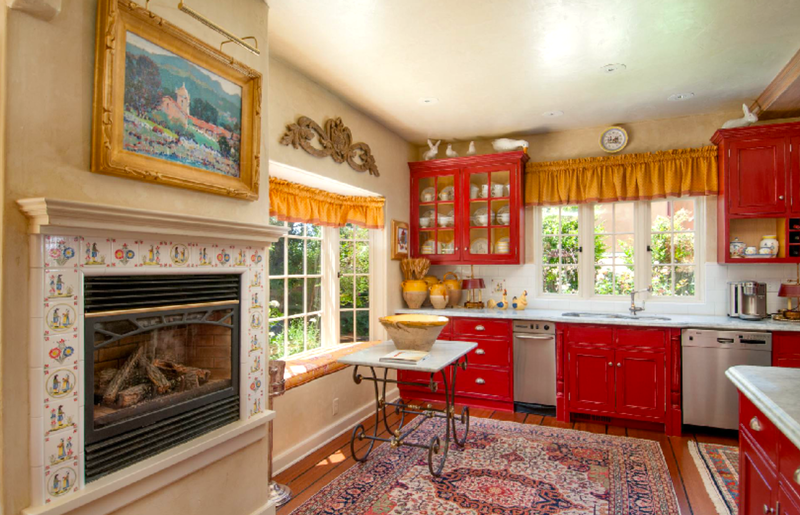 The original home on that lot may have been a Comstock, but this one is not. Great photos! i have not had a true ‘vacation’ in about 8 years. when the world is too much with me . 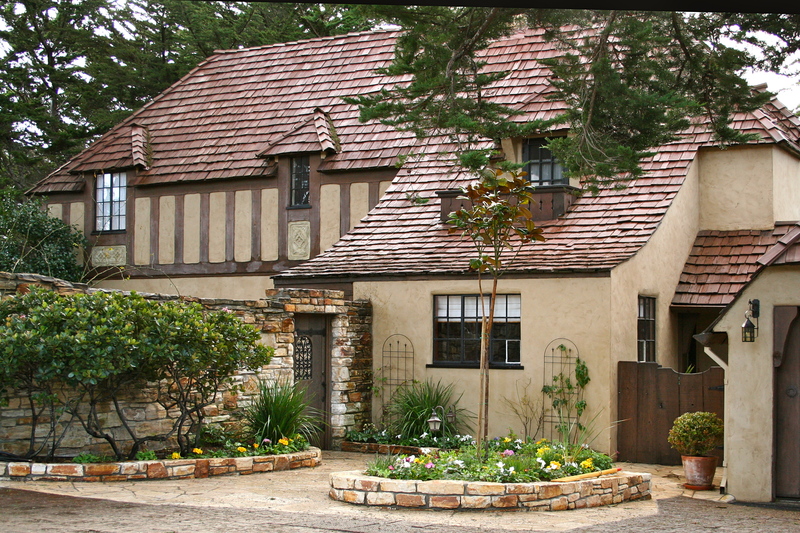 . .
i come to carmel and walk around the enchanting streets and cottages with linda. a special site. a special photographer. I found your blog through ‘peanut on the table’ and I’m so glad i did! 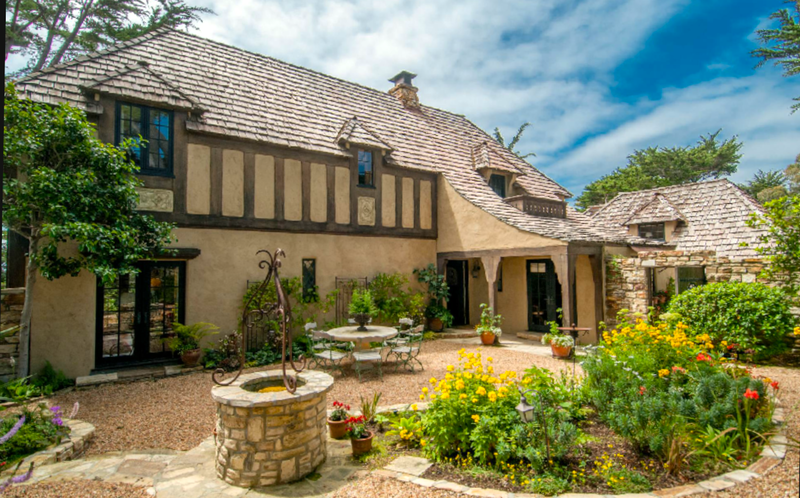 For years, I have loved looking at exterior photos of enchanting homes in Carmel from the other side of the world. And now, through your beautiful blog, I’ll be able to see glimpses on the inside.